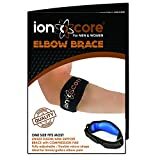 TENNIS ELBOW PAIN RELIEF – the unisex elbow brace from ionocore is the perfect solution to persistent elbow pain from racket sports and keyboard/computer use. MANY USES – Offers support from pain associated with sports injuries such as tendinitis, sprains, tennis elbow (epicondylitis), golfers elbow and injuries from manual labour. As well as support for weightlifting in the gym. ONE SIZE – 2 high-strength adjustable velcro straps for customisable compression and comfort to fit almost any arm and individual requirements. HIGH QUALITY – Durable medical grade quality EVA pad protects the elbow and arm and provides the best comfort and performance. Composition: 65% Rubber, 35% nylon. COMFORT – The ionocore elbow brace offers comfortable compression, and can easily be worn under your work shirt to help you through the day. Each strap can be worn on either your left or right forearm. Is tennis elbow pain losing you points on the court? Is your elbow so sore that you can’t keep your golf ball on the fairway? Do you have a stiff arm after typing on your keyboard all day? Need extra joint support to help with those heavy lifts in the gym? Too many trips to the physio? We’re here to help! The new ionocore® elbow brace is designed to offer a solution to these problems. The unisex innovative elbow support can be used by men and women who play golf, tennis, squash, badminton, snooker, pool or train for crossfit or weight lifting fitness exercises. ionocore® elbow brace may reduce pain associated with frequent use of computers, arthritis, tendinitis, and sprains. The brace can be worn on either arm. 2 durable, high-quality hoop and loop velcro straps allows for fully adjustable and customisable compression levels to suit the user based on personal requirements and pain levels. The medical grade EVA pad technology provides precise pressure to the tendons for perfect relief. The small, lightweight neoprene design makes the ionocore® brace suitable for all day use which can go unnoticed, without causing sweat. IMPORTANT: Hand wash only. Do Not dry clean. Do not iron. Do not bleach. Lie flat to dry. This entry was posted in Tennis and tagged Adjustable, Brace, Compression, Elbow, Golf, ionocore®, Lightweight, OneSize, Strap, Support, Tennis by FPSports. Bookmark the permalink.